Lisetteh studied fine arts at the academy for visual arts in Tilburg, The Netherlands, Cleveland College Fine Arts Middlesbrough, UK and Academy of fine arts in Antwerp, Belgium. Since 1997 sh​e h​as worked as a visual artist specialized in drawing, graphic art, installations and life installations, collage/assemblage. In 1998-2004 she worked as an artist in Antwerp and Mechelen and produced and curated her first Art shows. When she moved to Eindhoven in 2005 she met new artists with whom she undertook interesting art projects as TAC. (such as the "verstand van smaak" series in different cities of Holland and abroad) After moving back to 's-Hertogenbosch she started working with bART and CBK 's-Hertogenbosch. She started up some new Art projects about collaborations between different artists in different disciplines. This travelled around in the south of Holland "Match" and she created the first "Big Draw" in 's-Hertogenbosch, this is where she met Jolanda Jansen and out of this grew among other things the collaboration for P.S. Performance Festival the Hague, in 2015. Jolanda Jansen studied art at the Royal Academy of Art in The Hague. After this, she undertook a Masters degree at DAI; The Dutch Art Institute in Arnhem. Since 2007 she has been an artist in Video and Performance Art. In 2007 she established with 3 other artists in The Hague, the art collective; ‘stichting STeC’. Their organization strives to make Site Specific projects at original spaces. They collaborated, amongst others, with id11 in the Flatland project in Delft, a site-specific art project in the local environment. They presented the initiative at the ArtPie (Kunstvlaai) in Amsterdam. In 2009, Jansen was selected to participate in the Mentoring Program for emerging artists and curators of Cultuur en Ondernemen where she worked with as mentor, the artist Ulay. During one of her artistic projects, she met Lisetteh and after this they initiated the P.S. Performance Festival in The Hague in 2015. 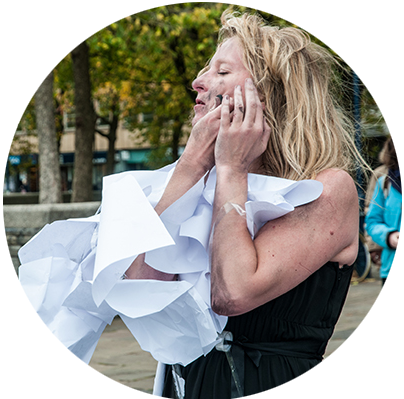 She has made several trips to do workshops in Europe to deepen her experience and grow artistically; PAS studies, by Johannes Deimling (Ge), IPA by performance duo Vest And Page (Ge/It) and the Marathon workshop by performance duo Zierle & Carter (Uk) and Dagmar I. Glausnitzer-Smith (Ge).